A pretty greeting card and card-box tutorial. Using a pretty butterfly die and stamp set, learn how to heat emboss on parchment paper for a beautiful effect. We think this design by Christina Griffiths of Card Making Magic, would be perfect for a wedding card or anniversary card idea. 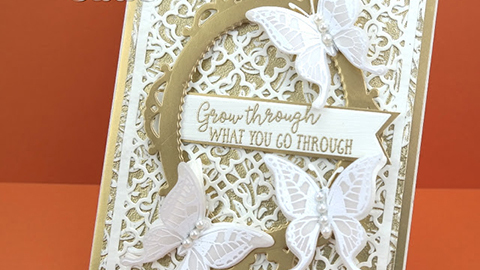 In this cardmaking tutorial, Christina uses Versamark ink and embossing powder on parchment to create this pretty gold and white butterfly design card and matching box. The parchment works beautifully as it is almost translucent, perfect for a delicate butterfly. The intricate butterfly die and stamp set she is using is designed by Christina herself, from her Card Making Magic range, available exclusively at CraftStash (we deliver worldwide). Christina designed a complete card and matching box die set, it’s really clever and means you can create perfect boxes to match your cards just like Christina does. Be sure to visit Christina’s blog!